You just eat one time in a day ? I've got some cornflakes for breakfast and i'll bring some veggie steaks in, I hope to be able to buy fresh bread over there. But mostly, that's it. And i've got some extra cans, so THEORETICALLY I could eat 2 of them a day.. But all isn't Vegan and in all Colruyt store so be warned. voiceless wrote: I've got some cornflakes for breakfast and i'll bring some veggie steaks in, I hope to be able to buy fresh bread over there. But mostly, that's it. Do you really needed to test ? 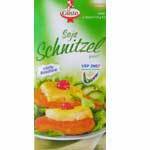 Vegetarian Schnitzel from Aldi Süd discount super markets. They recently changed the recipe and it should now be vegan. We had some with us for Wacken. Camping neighbours were very curious and wanted to taste, so i gave them a piece, not even baked, but one of them was really exited and said, he should be become a vegetarian. Don't know how serious this was meant, but it was nice to see. Of course. I'm an agnostic, I don't believe in anything, I need facts ;-) Empirical science rules! What do you do on festivals instead of bringing science forwards? delicious, I tried when I was a child. I don't like it that much, and I eat bananas all day long. Cool, i just realize I linked a french picture of it. My preferate dessert are those from provamel, Sojade is good, but more expensive.